Optic Fusion provides a high speed, low latency IP network with a 100% uptime guarantee. Our network features multiple upstream providers, provided on diverse fiber paths with separate entrance facilities that terminate on separate network devices. Gateways are connected to the core network through redundant uplinks, as are its distribution routers, providing high levels of redundancy and reliability. Optic Fusion uses BGP to provide optimal performance and automatic failover. 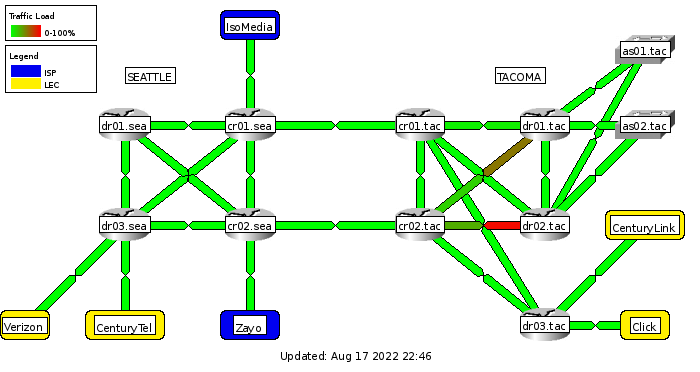 Also, Optic Fusion's network is IPv6 ready, all connections are dual stacked with native IPv6 all the way to the end users. The network is designed so that no single point of failure exists, and failover happens automatically.